Does it skeeve you out when the birthday candle drips onto the cake? Maybe I'm just weird but whatever random chemicals lurk inside dollar store candles aren't something I want touching my food and getting into my fabulous body. Fortunately there are healthy alternatives worth celebrating. 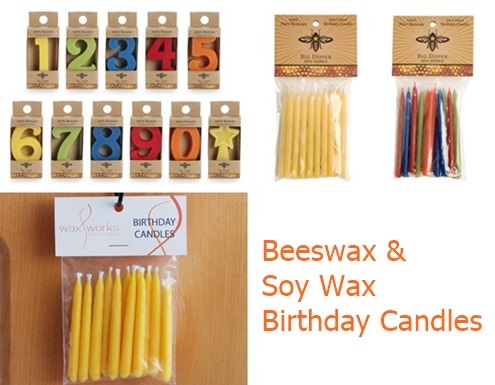 Beeswax and soy wax birthday candles are the perfect alternatives to petro-based paraffin wax. Big Dipper Wax Works makes beeswax birthday candles, with unbleached wicks, in natural or colored with eco-friendly dyes that are never tested on animals. They even make beeswax number birthday candles! Not down with beeswax? Waxworks Creative Candles sells handmade soy birthday candles in a variety of colors via Etsy. I think the yellow birthday candles are supercute! All of three of these options cost less than $5 and as Wendy at Simply Frugal Lifestyle points out, you can rinse, dry, and reuse birthday candles in upcoming years. This is great! No more paraffin cake!